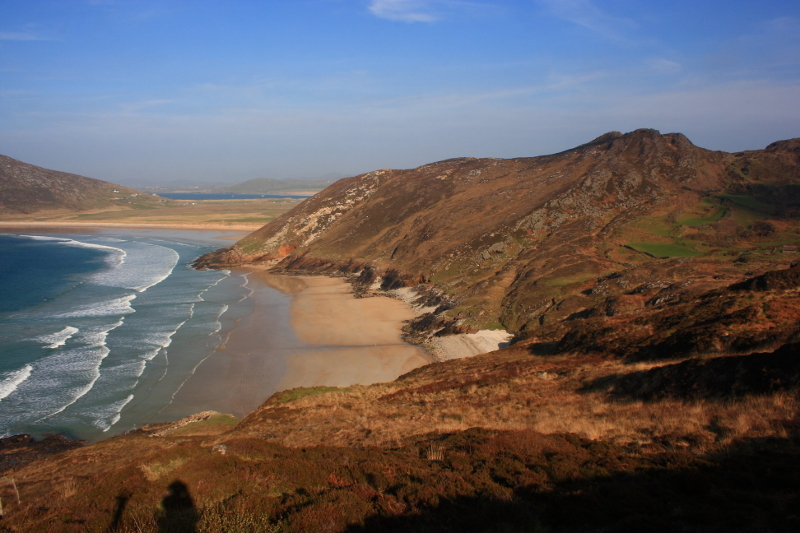 Glenoory beach, with Tra Na Rosann beach beach beyond, and Crocknasleigh Hill at the far side of the bay. 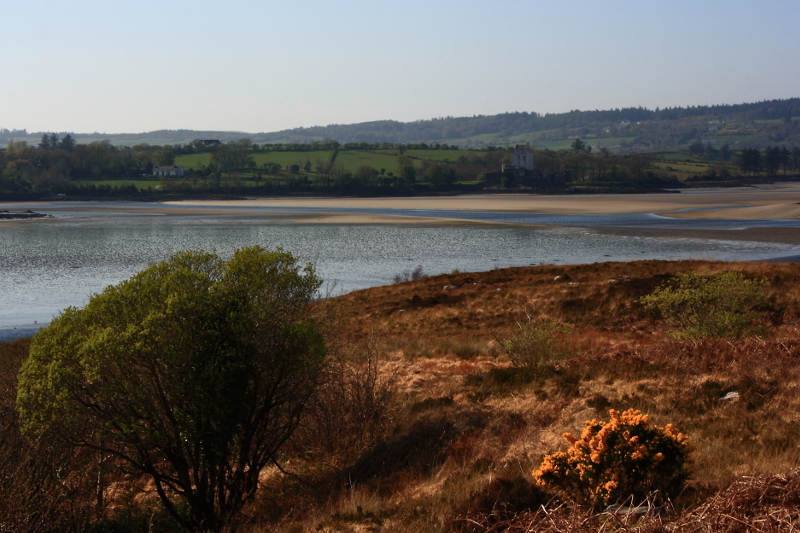 The photos in this post are from some day as those in the posts on Ards Forest Park, and Downies or Downings. 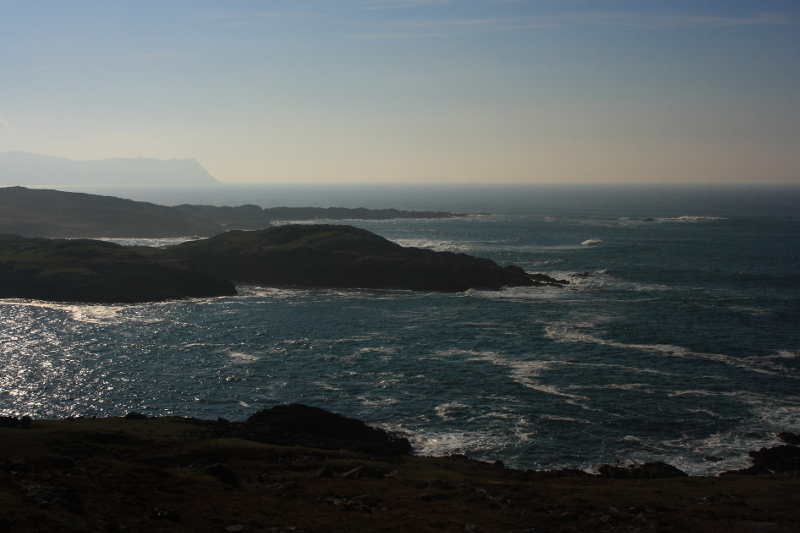 They were taken on a family day trip which included a drive round the Rosguill Peninsula in northern Co. Donegal. 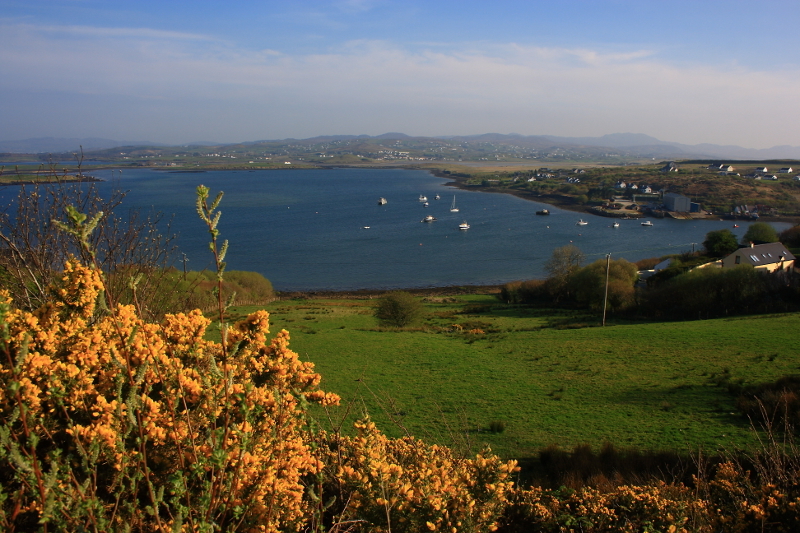 The peninsula is bounded on the east side by Mulroy Bay, and on the west by Sheep Haven Bay. 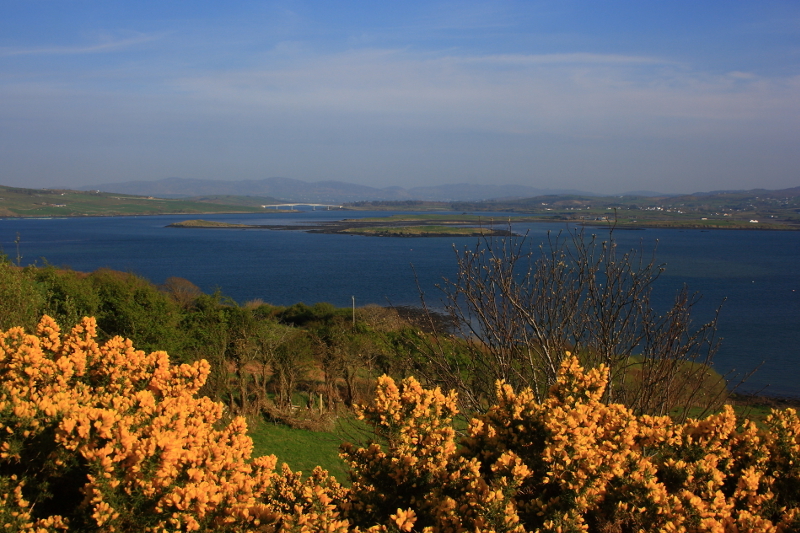 After leaving Ards Forest Park, we started the drive at the base of the peninsula on the western side, not getting far before stopping at a lay bay, with views across the southern end of Sheep Haven Bay to Doe Castle. Looking across the landward end of Sheep Haven Bay to Doe Castle, indistinct in the haze. 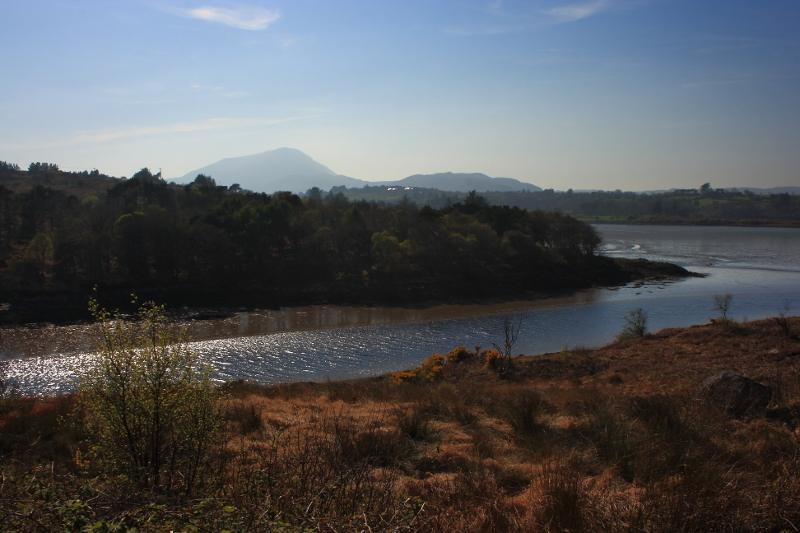 From the same viewpoint, with Muckish Mountain in the background. 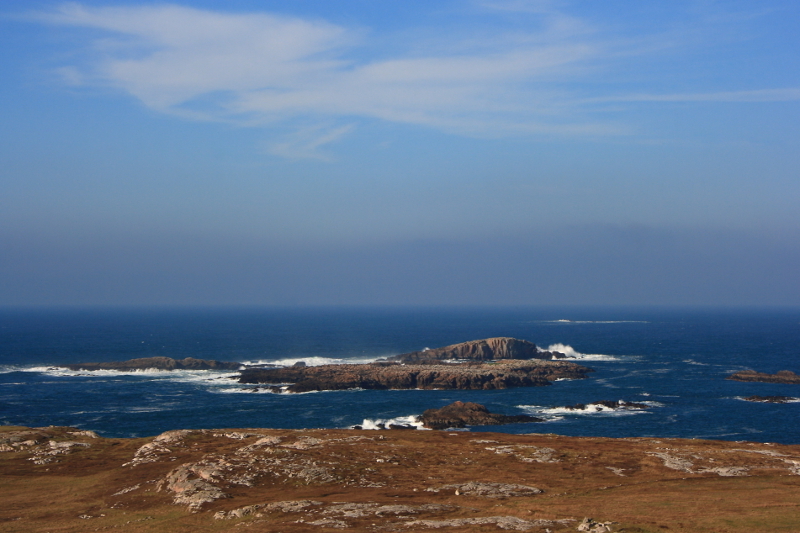 From Downies, we headed north around the now rugged coastline, and if it hadn’t been a family drive, I would either have been stopping every few hundred metres, or parking the car to walk along the coast, as the views were spectacular. Looking across Sheep Haven Bay, with Horn Head in the far distance. Another shot towards distant Horn Head from the same viewpoint. Looking north to the open Atlantic. 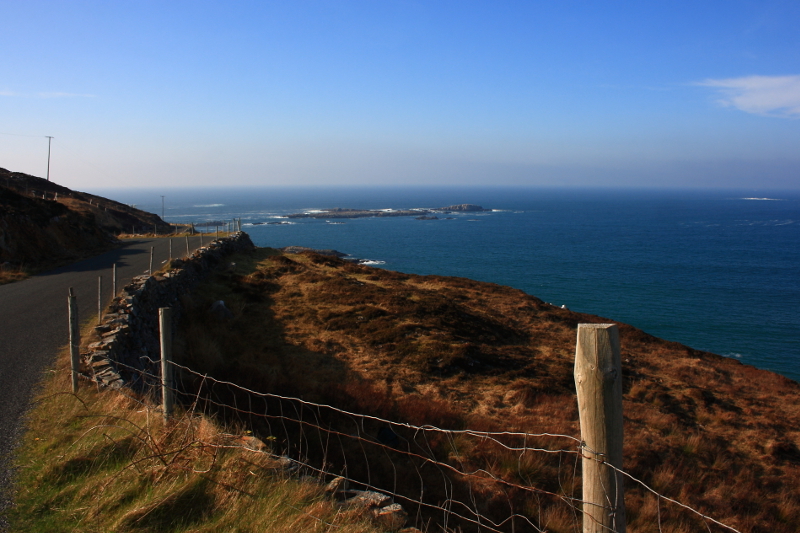 A look back along the Atlantic drive road. Our next stop was at one of my all time favourite views. It takes my breath away any time I look at it, and even testing my family’s patience with another stop couldn’t prevent me from pausing here! 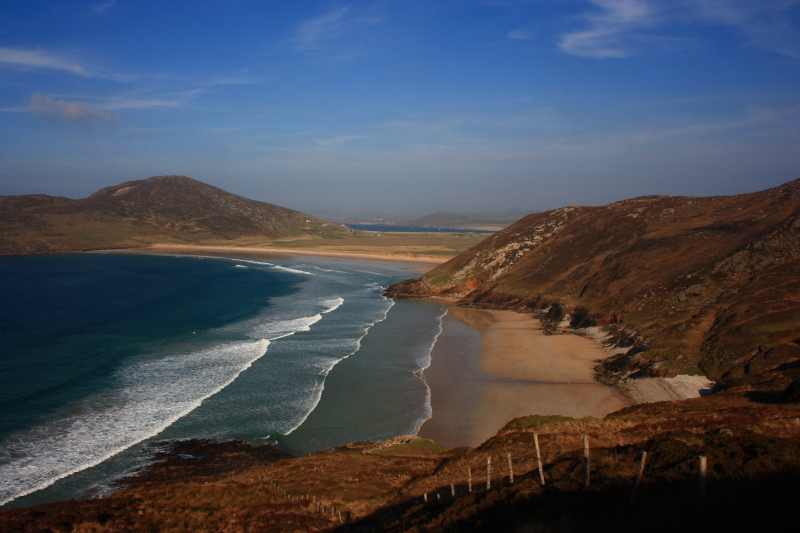 The view takes in Glenoory beach at the foot of a rugged hill, with Tra na Rossan beach beyond that. 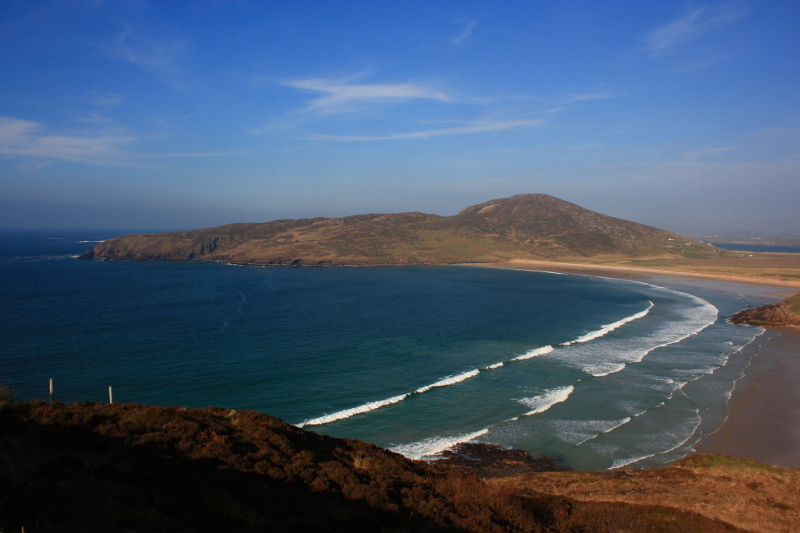 It in turn, curves round to Crocknasleigh Hill, which leads to Melmore Head at the northern tip of the peninsula. I think it is one of the most beautiful sights in Ireland, or anywhere else for that matter. Needless to say, I took many photos here. 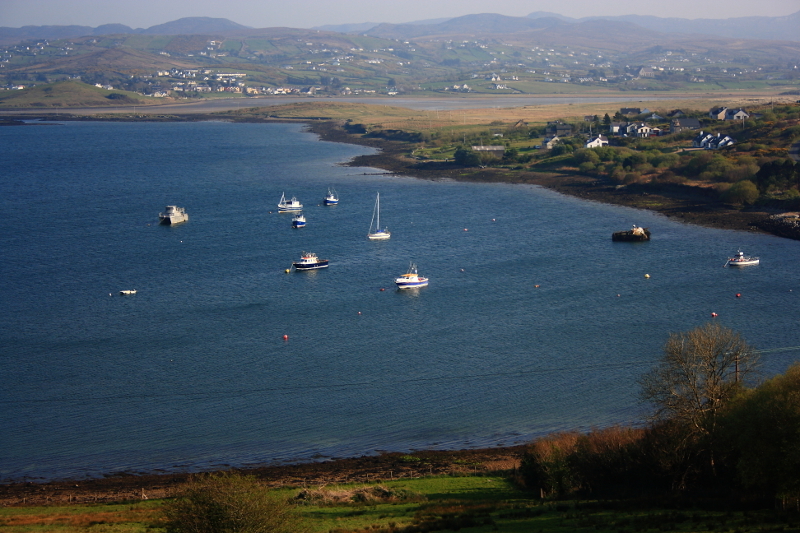 It was with some reluctance that I left this spot, and we began to make our way southwards again along the eastern coast of the peninsula, now overlooking Mulroy Bay. 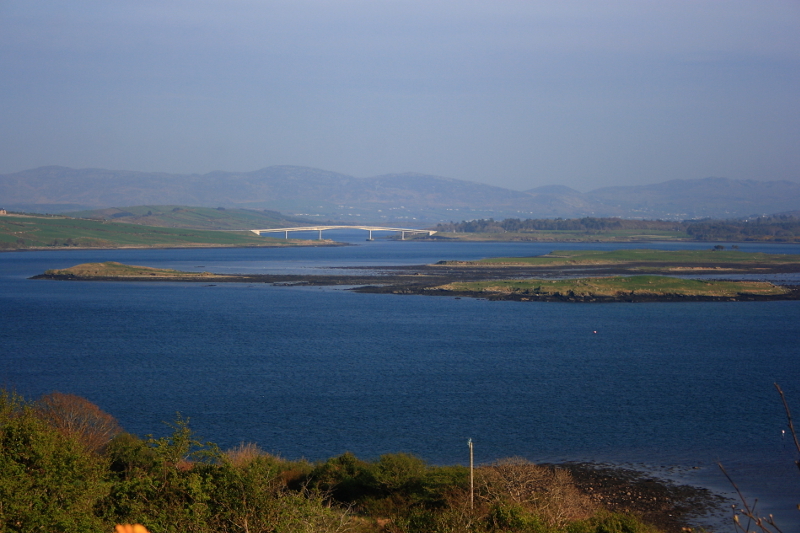 I pushed my luck with one last stop in the Kinnalargy/Mevagh area, to look down on the harbour with its scattering of boats, and on the other side of the Bay, the Harry Blaney Bridge, linking the Rosguill and Fanad peninsulas. The drive had now come full circle, almost back to Downies. 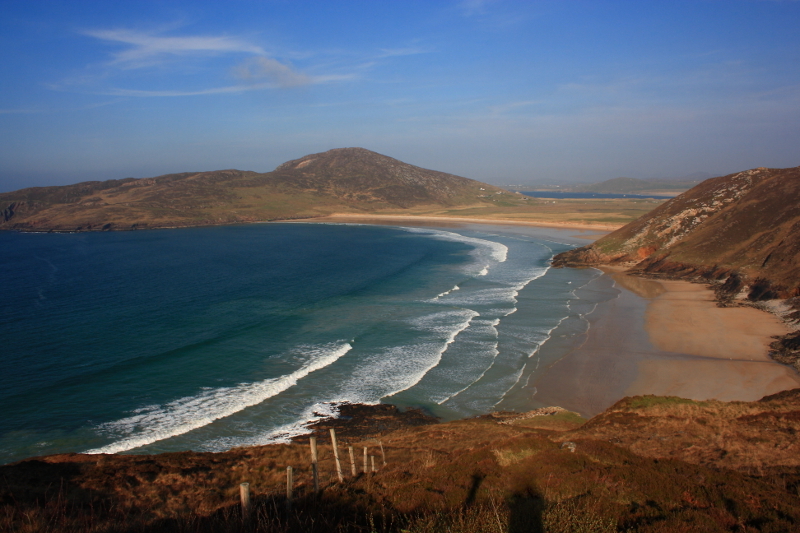 I would definitely consider it to be one of the most beautiful stretches of coastline in Ireland and I will certainly return to explore it at a more leisurely pace. Magnificent place. 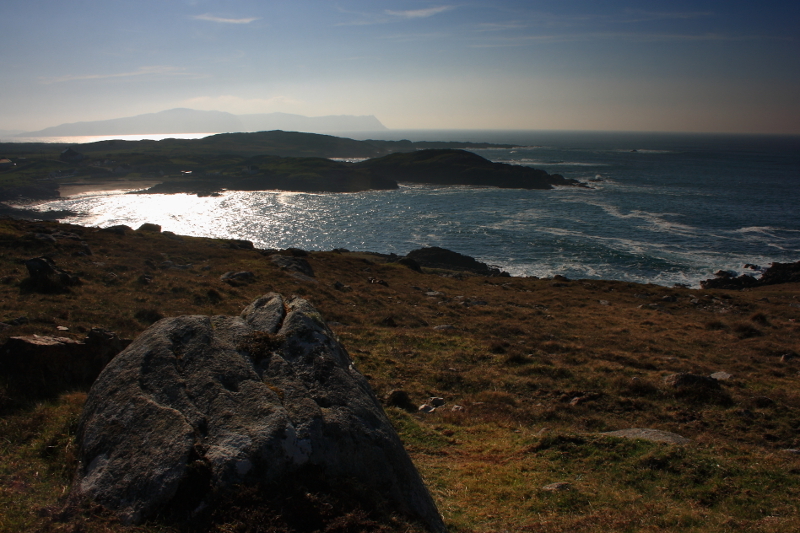 Posted in Landscape, Nature, PhotographyTagged bay, beach, Crocknasleigh, Donegal, Fanad, Glenoory, Harry Blaney Bridge, Head, hill, Ireland, Melmore, Mulroy, Rosguill Peninsula, Sheep Haven, Tra na RossanBookmark the permalink.